is a religious ritual performed by Hindus as an offering to various deities, distinguished persons, or special guests. It is done on a variety of occasions and settings, from daily puja done in the home, to temple ceremonies and large festivals, or to begin a new venture. Puja is modeled on the idea of giving a gift or offering to a deity or important person and receiving their blessing (Ashirvad). The two main areas where puja is performed is in the home and at public temples. There are many variations in scale, offering, and ceremony. Puja is also performed on special occasions such as Durga Puja and Lakshmi Puja. 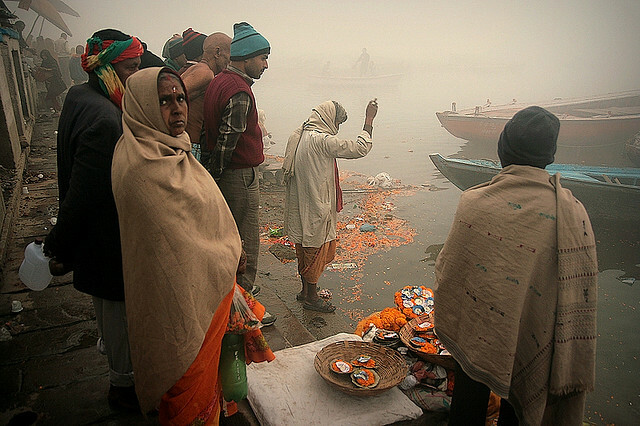 The puja ritual is performed by Hindus worldwide. Various poojas are performed at various times of the day and on various occasions. Ganga puja (ritual of prayers) for the Ganges at Dasawamedh Ghat.
. WKD : Kanjak puja ritual .
. WKD : Parikrama circumambulation .
. WKD : Sari robes and puja .
. WKD : Shiva Raatri Night Pooja .
. Faith and Prayer . kitoo 祈祷 is often translated as "prayer"